I was invited to a private viewing of Villancher Boutique Fashion Jewellery last night. Esther Hocking, founder of the enterprise, set up her fashion boutique jewellery line after struggling to find the style and individuality she wanted, at affordable prices. Hand picked from around the world, Villancher offers a wide range of stylish fashion jewellery pieces and with only a few of each, there is a special feeling of uniqueness that goes with them. Villancher currently stock Moon C, a brand from Paris, plus J9TwoFive, a range designed and hand crafted in Sri Lanka. So they’re pretty special! There were so many gorgeously unique pieces on display, but to me, the two ranges that I loved were the dolly necklaces and the charm bracelets. Pink Star‘, ‘Pink Diamante‘ and the ‘Leopard Skin Trousers‘. The chains are approx 40cm and the dolls themselves 12cm, so they’re a really lovely size and weight and truly a gorgeous accessory that will make a real statement. These necklaces would add the finishing touch to a simple white t-shirt and jeans or could easily be dressed up with a little black number. The dollys are priced at just £28.99 each. The bracelets are equally as beautiful and individual as the Dolly necklaces. The bracelets come in various colours and designs and each bracelet consists of a number of bracelets, attached together. The Multi Strand Silver & Green Bracelet, £22.99, is charming with it’s aqua green/blue, silver and wooden beads. The little heart charms are really sweet too, adding that extra dimension that I love about these pieces. The Multi Strand Pink Ibiza Bracelet, £23.99, is also really cute. The collection of four bracelets as one, have little red, ivory, blue and purple cross charms, plus a silver shell and other little strings of beads, dangling from them. It’s simply adorable and by far my favourite. So I bought one! The Pink Ibiza Bracelet is part of the Moon C collection from Paris and I think it’s great. I’m especially in love with the little jangling sound it makes and that I’m wearing something brought over from Paris and not many people will have one the same. That makes it just a little extra special. Take a look at the collection for yourself. I’m sure you’ll find a piece to fall in love with too! 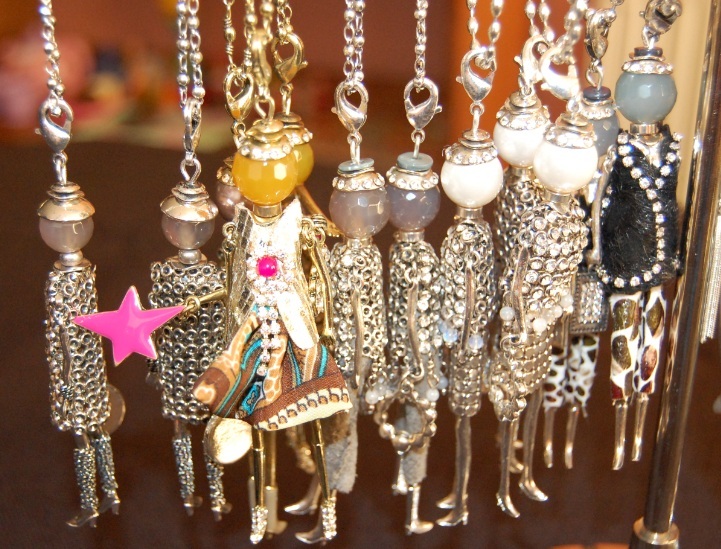 I love the doll pendants!